Sexual abuse infects every aspect, every relationship of our lives, but especially our marriages. Brad and Cheryl Tuggle share their story to show readers how marriage can be a refuge of openness and healing. - Publisher Childhood sexual abuse isn't something discussed in polite company. It's too horrible, too personal, and too painful. But if nobody talks about it, how will anyone heal? 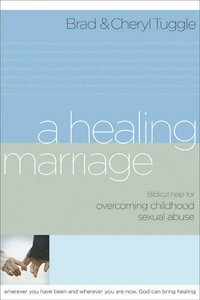 For relationships in which someone has been sexually abused, A Healing Marriage opens up new levels of trust and communication. Learn how you can heal from your past and: -Overcome needless shame -Repair emotional attachments -Rediscover sexual intimacy Don't let your marriage suffer in silence. Allow God's promises to bring hope for the future. Both you and your spouse will want your own copy of this workbook style guide to a healing marriage. You can't undo the past, but you can rise above it. Childhood sexual abuse isn't something discussed in polite company. It's too horrible, too personal, and too painful. But if nobody talks about it, how will anyone heal? For relationships in which someone has been sexually abused, A Healing Marriage opens up new levels of trust and communication. Learn how you can heal from your past and: -Overcome needless shame -Repair emotional attachments -Rediscover sexual intimacy Don't let your marriage suffer in silence. Allow God's promises to bring hope for the future. Both you and your spouse will want your own copy of this workbook style guide to a healing marriage. You can't undo the past, but you can rise above it. Tuggle is a minister at Oak Hills Church.